The filmmakers of Fantastic Beasts: The Crimes of Grindelwald somehow managed to up their game from the first film. Across the board, the story, special effects, character development – all of it – is even better than the first go around. For a film already set several decades back from Harry Potter’s time in the wizarding world, there are quite a few flashbacks – there’s lots of information to take in. The film is chock full of Easter eggs for Potter fans, so keep your eyes and ears open, especially for some old names and magical objects, as well as familiar places – yes, we mean Hogwarts! One of the best parts of the film are the scenes where we get insight into Albus Dumbledore’s past. We learn more about his relationship with Grindelwald, and get to see what kind of teacher he was at Hogwarts. We’re really looking forward to getting to know even more about Dumbledore in future films. An old, yet new, character introduced in the film is Nagini in human form. The future Horcrux for Lord Voldemort plays a faithful companion to Credence, so it’ll be interesting to see how this caring character eventually develops into someone who works on the side of Death Eaters. Newt’s brother Theseus and fiancé Leta Lestrange bring an interesting love triangle element to the story. Between old feelings that arise and a miscommunication with Newt’s love interest Tina, things don’t go very well. And then there are the magical creatures. The baby Nifflers are adorable and hilarious, with their mother playing a rather significant role in this film. 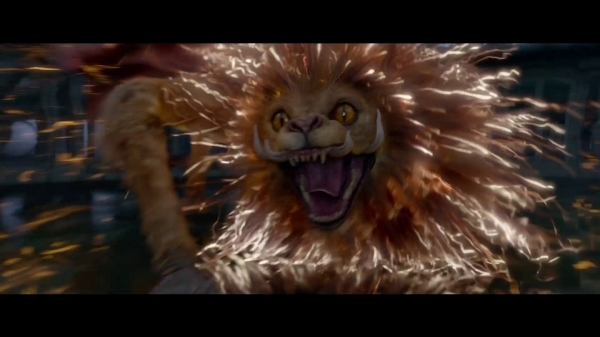 Our favorite new creature is the Zouwu, a giant lion-like beast that can fly, which when calm, has a temperament somewhere between a playful kitten and a puppy. As everyone knows, there is a big reveal in this film. Eddie Redmayne himself stated that his “jaw dropped” – and he wasn’t kidding. Many in our audience were shocked and, quite frankly, confused as to how this reveal could be possible. And, considering the source of the information, we’re not really 100 percent sure it’s true as this person has been known to tell a lie a time or two. In any case, this new information will make for great fan discussion and theories while we wait for the third installment of the Fantastic Beasts series. Fantastic Beasts: The Crimes of Grindelwald hits theaters Friday, November 16. You can preorder tickets here through Fandango.